I am a home cook who likes to share recipes I think others will enjoy. A timeless comfort food, chicken pot pie has been a favorite since before our grandparents. Like many great dishes, however, the recipes change as they're handed down from generation to generation. The beauty of this dish is that it nearly always provides a warming feel and rarely fails to satisfy an empty stomach. In fact, I've often prepared this dish when I'm concerned about how I'll satisfy a diverse group of tastes and it's never let me down. 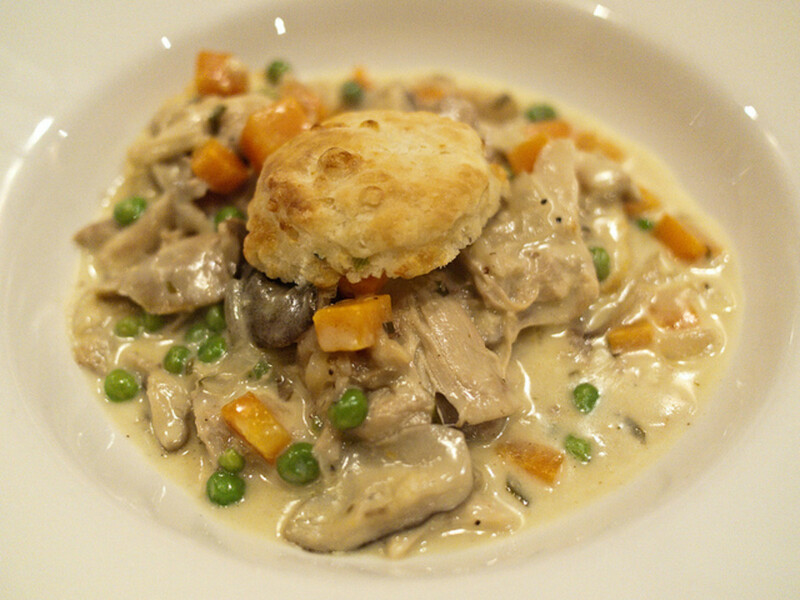 This recipe for biscuit chicken pot pie isn't for those searching for lighter fare. It's a more traditional recipe, but one that certainly provides plenty of rich flavors. Above all, however, it's simple, easy to make, and can be personalized to suit the palate of your own family or guests. I generally prefer dark meat as I feel it has more flavor but if you prefer breasts that will certainly work just fine as well. 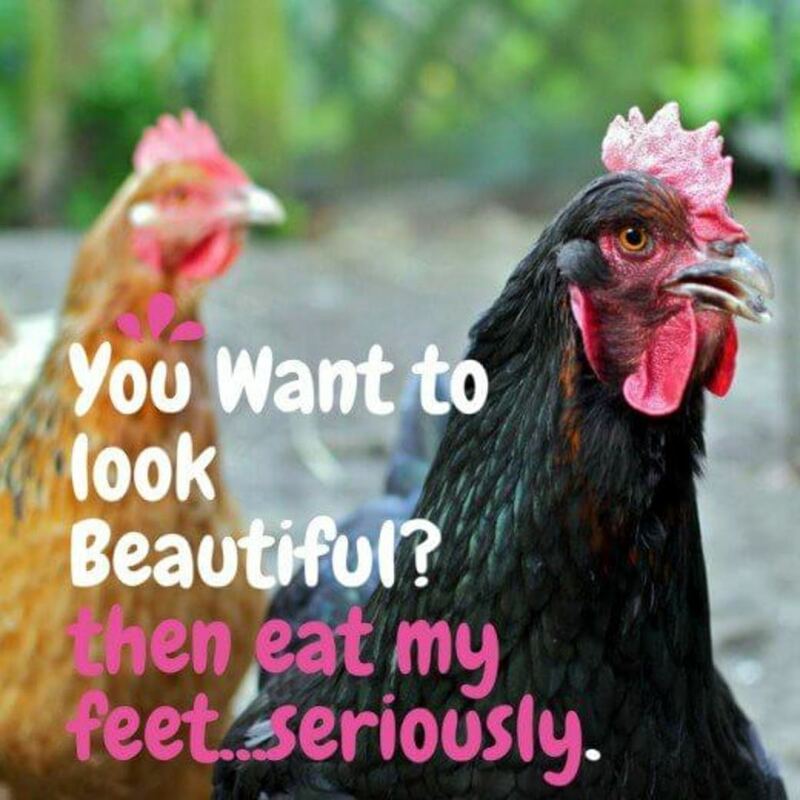 To make life easy I tend to stick with boneless, skinless varieties. 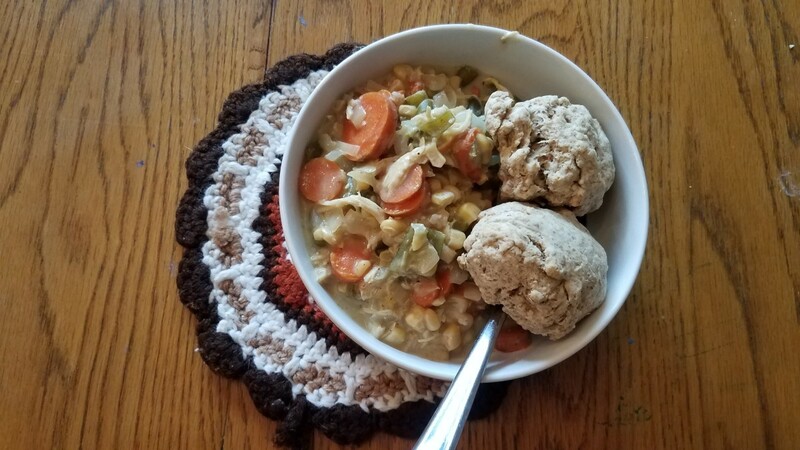 However, if you don't mind the extra work, the chicken can retain more flavor and moisture if it's prepared with bones and skin intact, and then removed before shredding and adding to the chicken pot pie. Again how you prepare the chicken is up to your preference. You can even use meat that is already cooked for other purposes. Merely shredding it into small pieces for our pot pie. I've also used the rotisserie chicken that most larger grocery stores sell. It tends to be moist and flavorful. One method of preparation, however, is to brine your chicken (soak it in a salt and water solution) in the refrigerator for 1 hour and then place in a saucepan, cover with water, and simmer for 15-17 minutes on the stove top. Remove the chicken, cool, and then shred for use in your pot pie. Personalize your dish based on your family's favorite vegetables. 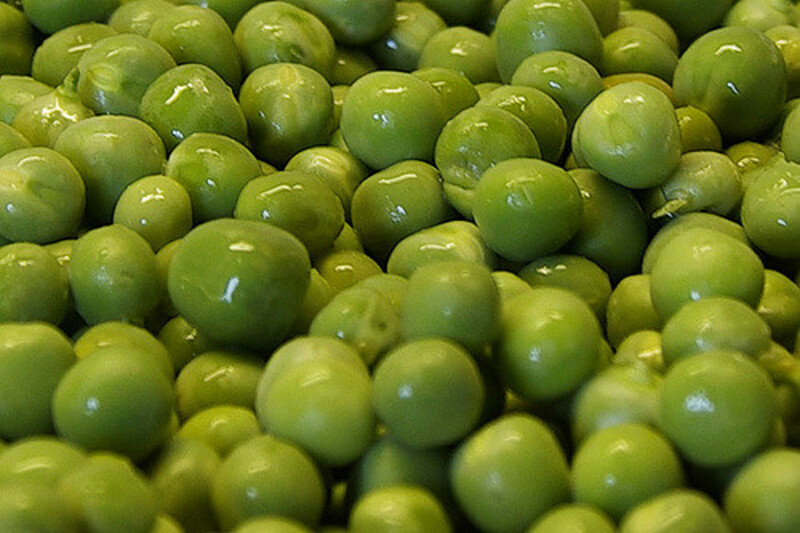 You can use frozen or fresh, or if you're in hurry, canned. For carrots, peas, green beans, I merely cook them on the stove top. If I use mushrooms or celery, I sauté. Potatoes are boiled. I generally prefer tender-crisp for all vegetables to avoid overcooking. Drain and add to the shredded chicken. To top off your biscuit chicken pot pie, you need biscuits. You can use any biscuit you prefer. If you're mixing up homemade or Bisquick type biscuits, you will merely place the batter on top and bake for the time indicated for the biscuits. For refrigerated biscuits, I usually use large, fluffy Buttermilk or Extra Rich biscuits. With these, you should place the baking dish with the vegetables, poultry, and sauce in the preheated oven for 15-20 minutes before adding the biscuits. Then, arrange the biscuits on top and return to the oven for 13-15 minutes or as indicated on the biscuit packaging. The sauce is the basis of this biscuit chicken pot pie recipe. The rest is really up to your individual taste. You have the option of making it differently each time you prepare it. Mix it up and have some fun! Preheat your oven to the temperature indicated on the biscuits, generally 375°. Cook and shred chicken. Place shredded chicken in 8x12 baking dish. 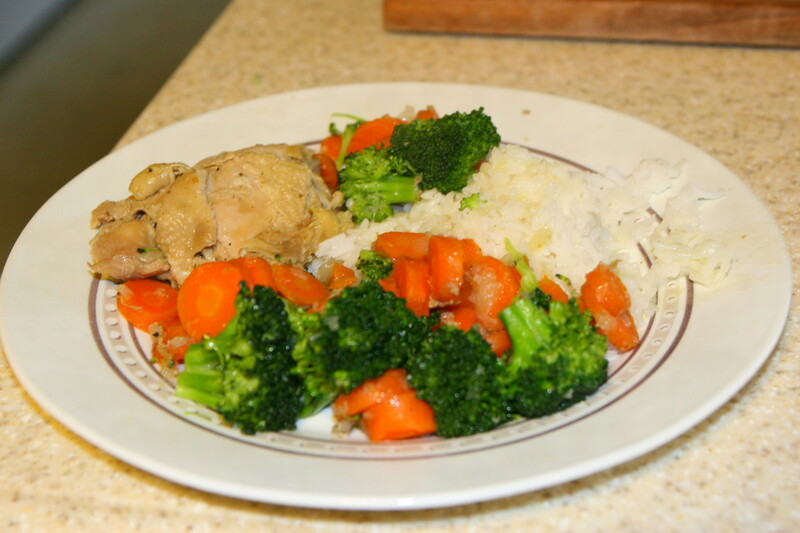 Chop and cook vegetables (tender crisp), drain, and place in the baking dish with the chicken. Melt 3 tablespoons of butter in the pan and sautè the diced onion and garlic for 4 or 5 minutes, until tender. Toss in rosemary and then stir in the flour. Cook for 1 minute over low heat. Turn the heat up to medium and gradually pour in the chicken broth, stirring with a whisk. 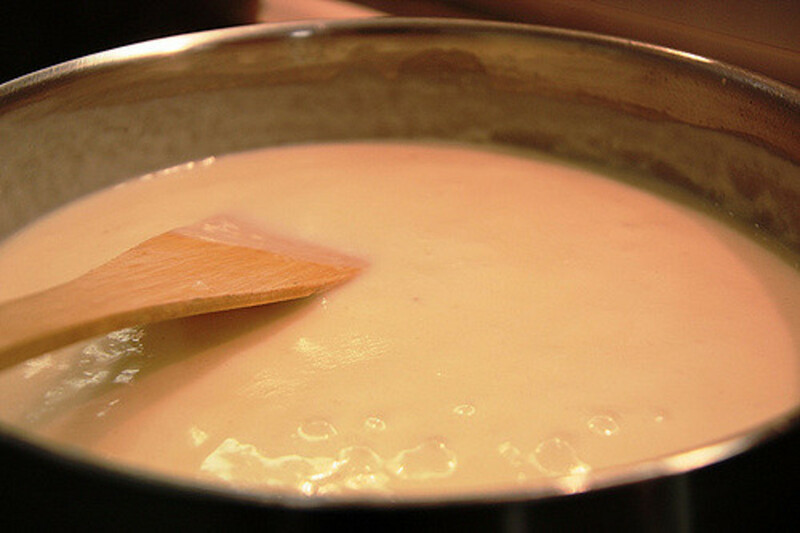 Allow the sauce to thicken and gradually add whipping cream. Once warmed throughout and thickened, pour the sauce over the vegetables and chicken. Top with the biscuits and bake. For homemade biscuits, drop the dough on top, and then place in the preheated oven to bake for 30 minutes or per instructions for the biscuits. If you're using refrigerated biscuits, wait to place them on top. 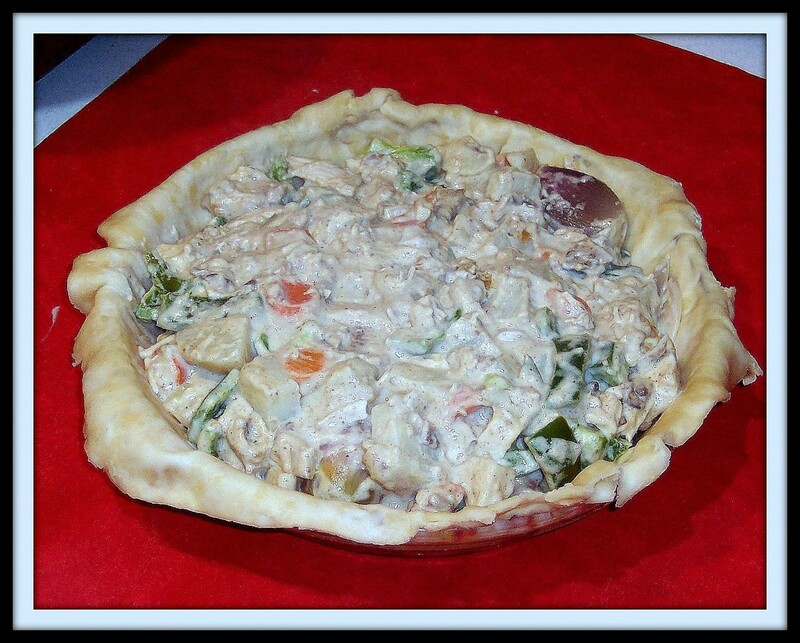 Instead, place the baking dish with chicken, vegetables, and sauce in the oven to bake 15-20 minutes. Then place your refrigerated biscuits on top, return the baking dish to the oven, and bake another 15 minutes or until the biscuits are done. 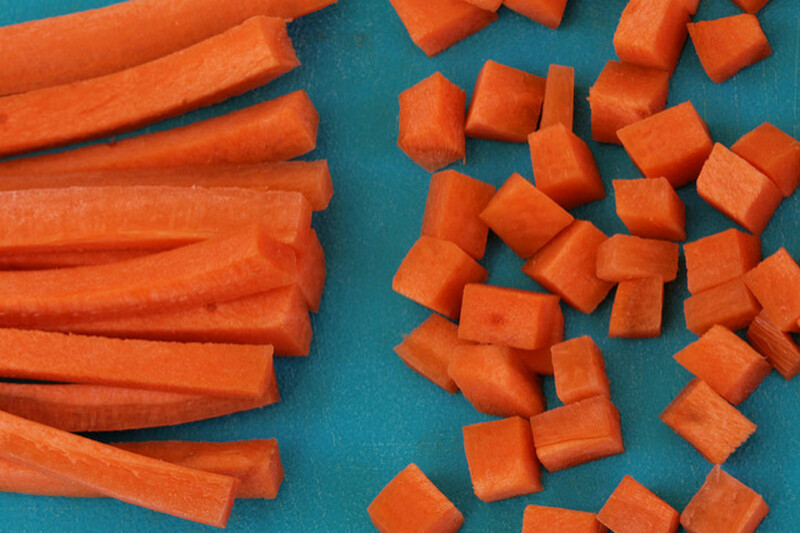 A simple cool, crisp salad to start. This will be in contrast to the warm, creaminess of the pot pie. This recipe reminds me of chicken empanada that we made in our culinary class in high school. The chicken pot pie is baked, while the empanada is deep fried to cook the dough. Great recipe! How did you know I had to cook chicken today? I mean really! sounds good, and easy to do. Geat hub i'm going to try it out. Usually we use puff pastry for our pot pie topping, but I have to admit that those biscuits look pretty darn good. May have to give that a try next time. This sounds great! I make something similar but use cream of chicken soup for the sauce part. Thanks for sharing! its on its way to oven, can't wait to eat it. so easy to make even if i did cheat and buy a rotisserie chicken -- saves time and is flavored so good. This was one I always loved when my mom made. I just had no idea how to do it myself. Delicious! 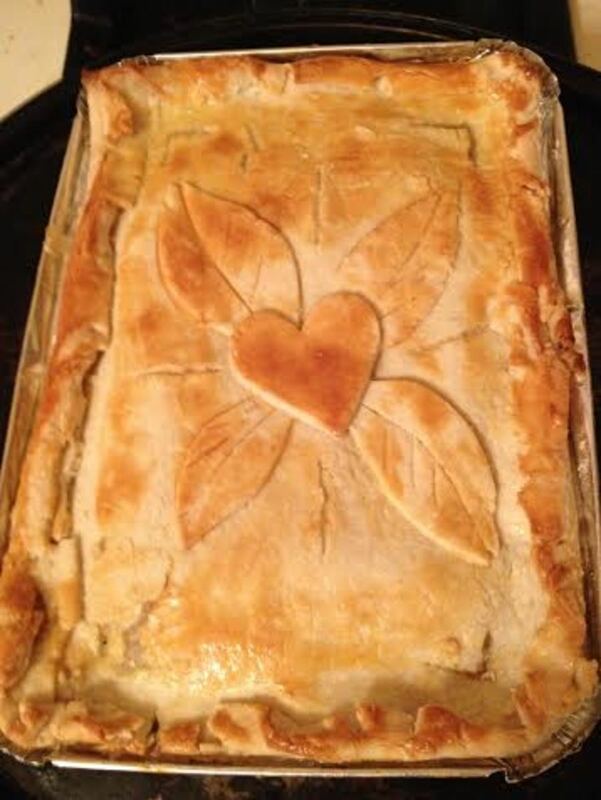 My mother used to make a pot pie I loved and I have been wanting to find a good recipe to make my family. It sounds rich, saucy, and delicious. I guess it's from the USA, that's where I'm at, and I put it together from other recipes I was familiar with here. Is this a british dish or one from USA ? This was one of my favorites as a child, but I only ate it in restaurants because my mother did not make it. Thanks for the terrific recipe. I will have to try it and see how I do. 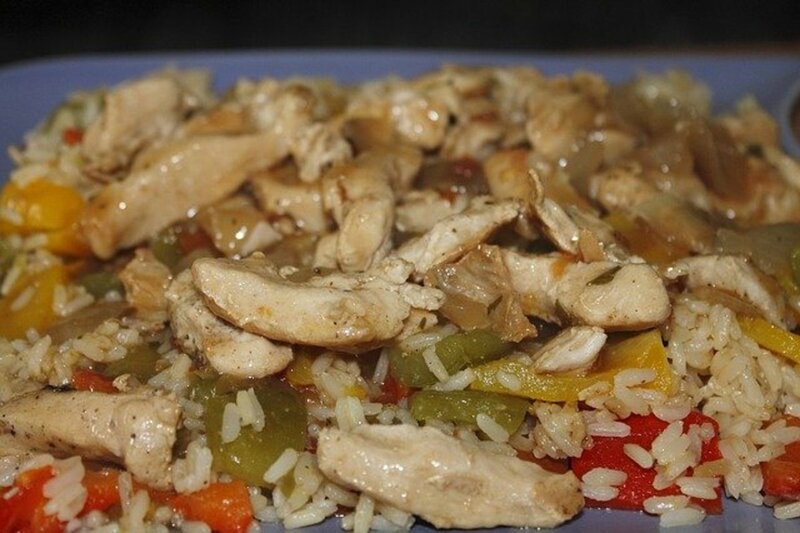 This is a great dish to make with leftover turkey or chicken from another meal. The more meals you can get out of a bird like that they better off you are especially in these tough times. This looks delicious!... Will have to try it. This sounds really good. I think I will try it tomorrow! Great recipe &amp; very professional hub. That is too pretty to eat! Makes me hungry and it 's too late to eat. Nice hub! First time to hubpages. Sounds great, you are making me hungry!